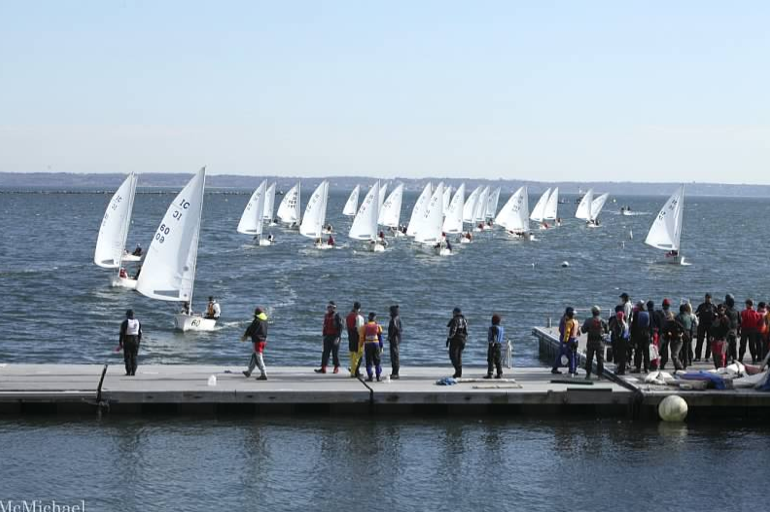 A record 35 teams turned out for the 2012 Interclub Midwinter Championship at Larchmont YC on January 28 & 29, 2012. The 146 sailors (70 skippers, 76 crews) represented the largest gathering at an IC regatta in nearly 16 years, and those who attended were not disappointed. A rare January southwester filled after the first race on Saturday at 8-14 knots with stiff chop, followed by a shifty, puffy westerly on Sunday of similar velocity to allow for 20 races over two days. The Interclub Midwinters features “college-style” racing — competitors team with friends to form “A” and “B” teams, with the lowest combined score winning the regatta. Each race is 10-15 minutes in length and there are no discards, placing a premium on consistency and short course strategy. Sailors rotate divisions every three to four races to keep warm, though the warm weather allowed everyone to spectate from the lawn and porch while sipping soup between sets. Past IC national champions John and Molly Baxter, and Danny Pletsch and Jane Delashmutt, all St. Mary’s College alums racing for the home LYC club, sailed consistently to finish seventeen point ahead of Team 21, Ben Cesare, Dorsey Roseberry, David Dowd and Tricia Leicht to win the title. Clay Bischoff and Kendra Emhiser won the A division, and finished third overall with teammates Ted Ferrarone and Meredith Killion. Despite the overall win, Baxter and Pletsch each scored at least one race of 16th or worse in the competitive fleet that featured three former college sailors of the year, 18 former collegiate All Americans, and several national and world champions from a variety of classes. The Midwinters counts toward the Wharf Rat Challenge, a trophy donated by Steve and Heidi Benjamin for overall performance during the winter IC circuit. The next Wharf Rat event is the Stanley Bell Memorial at Larchmont March 17-18, followed by the Tally Cup at Cottage Park YC (Winthrop, Mass.) in early April, culminating with the nationals April 28-29 at Rochester YC. Thank you to Heineken for its continued support of IC class regattas at Larchmont.